SPOILER ALERT!!! you have been warned. Now this is organized like this #6 least emotional #1 most emotional and THIS IS MY OPINION OKAY?! but please let me know your top 6 in the comments below! 6.Yellowfang: She was born to shadowclan and then she got super powers and her life turned upside down! she had kits she wasn’t supposed to Raggedstar completely forgot about her. and brokenstar shunned her and killed the love of her life! then she had to kill her very own and only child/son. she finally met her end during a fire, she was only protecting her clan! why could she not have lived starclan WHY?! 5.Quiet Rain: She was in the dawn of the clans. we did not see much of her but in the forest divided during her last moments it got pretty emotional. and honestly this cat has been through a lot! I mean her youngest and only daughter dies then her other son goes on a journey and she will never see him again and to make matters worse her youngest son runs off after him so she sends her other son after him and she is left with no son or mate! 4. Bluestar: The great thunderclan leader! before she died we saw her in a weakened out of mind state which in human life would be classified as mental health issues. Now she had Firestar and Whitesotrm’s support as well as her clan. but she could no longer trust anyone! Then her childeren found out the truth and instead of loving her or at least forgiving her they hated her. Bluestar went into an even worse state. but at her last moments her clarity was restored and her children accepted the truth. However it was still sad poor Firestar! 2.Ferncloud; She was the big mama and Dustpelts whole life. I choked at the scene where dustpelt saw her and well it was one of the most emotional moments ever! 1. Graywing: for those who have read all the books of dawn of the clans like me you will understand. He has been through so much loved so many and gave up to many things. He had kits at the time too! we all know he struggled with the breathing but we though he’ll just have a slight coughing problem like Nightstar. And the way it was written WHY!? I cried when i read that part when the kits realized he was dyeing and even before that at Tall shadows camp when Clear sky realized it too! he was one of my favorite characters, and in my opinion had the most emotional death. 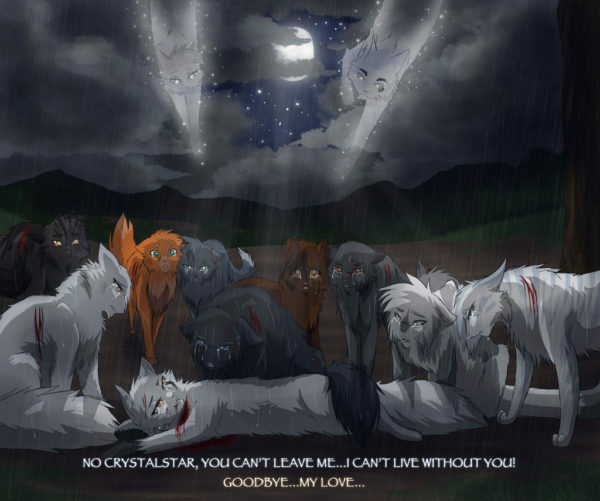 35 Responses to "Top 6 saddest deaths"
silverstream and badgerpaw/fang ….. rip forever! how did Silverstream die, and who’s Gorsepaw?